Thermarest's Neoair XLite replaces the original Neoair pad, offering upgraded warmth (from a spec value of R2.4 to R3.2) at a slightly lower weight—one ounce less overall. The weight differential isn't really big news, but the added warmth is: an R-value of 3.2 is pushing into the 4-season category, and even for 3-season use, you will absolutely notice and enjoy the extra warmth anytime overnight temperatures get chilly. In fact, I'd say for summer Sierra backpacking, the warmth upgrade is basically a must-have feature. Why? Because for lightly-padded hikers like myself, chilly ground like you'll find at Iceberg Lake otherwise forces you to carry thicker, heavier sleeping bags, or supplement insulation by putting extra padding beneath your core. The original Neoair's 2.4 value kind of sat right on my comfort threshold for cold 3-season ground—good enough, but not great. Where the original Neoair pad has an advantage, however, is shape. The XLite shaves ounces (or, in this case, one ounce) by reshaping the pad to reduce material at the head and feet. Overall length and width remain the same, at 20" x 72", but the pad feels noticeably smaller overall because of the tapering. For toss-and-turn sleepers, this does make for a less restful night. I found myself have to be mindful to stay centered on the pad—something which wasn't as much of an issue with the original Neoair. Ultimately this proved consequential enough for me to wish Thermarest offered an original-sized Neoair pad with the XLite's warmth upgrade. I'd gladly carry the extra ounce for the original Neo's added surface area. That said, the design goal of the Neoair series is obviously to be as light as possible, and the XLite is absolutely an aggressive advance in that direction. As I say, the warmth improvement really is a must-have feature (at least for me), and so we can fairly say that for everything but warm weather (ie, desert) backpacking, the XLite does indeed render its predecessor obsolete. 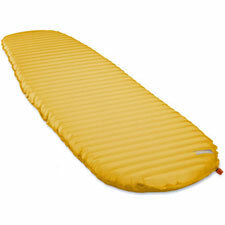 One final warming: as with the original Neoair pad, the XLite loses essentially all its insulating value when deflated. This means you must carry the puncture kit with you in any situation in which you are depending on the pad for survival (and if it really matters, add a backup foam pad or choose a heavier, more robust pad altogether). A regular-length XLite measures 12.7 ounces on my scale without the patch kit. With the kit, it's 13.0 ounces. I recommend you carry the patch kit at all times.